Reading the article took me back to the early days of my career in gifted education when E. Paul Torrance was still alive and at the forefront of the research as well as development in the area of creativity. It takes me down memory lane in terms of all the work I’ve done over the years with direct or indirect goals and outcomes related to creativity development. 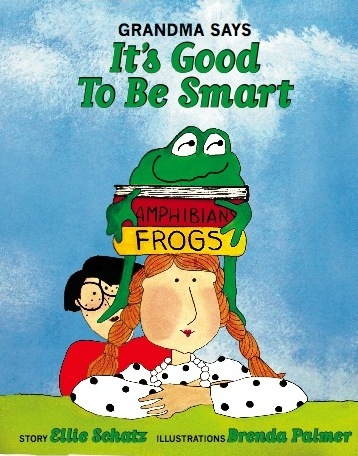 There are several important messages from the Newsweek coverage to discuss in relation to my current interest in writing and publishing children’s picture books on the topic of “smartness.” The first is the misunderstood definition of creativity. It is not just about imagination and playing with ideas. In reality creativity is the “production of something original and useful…to be creative requires divergent thinking (generating many unique ideas) and then convergent thinking (combining those ideas into the best result).” I hope and believe that in “Grandma Says It’s Good to Be Smart,” I portray the importance of encouraging our children to develop and use both kinds of thinking. Second, the article reports that preschool children ask their parents about 100 questions a day. Often those questions start with, “why?” and tragically, as the article continues, it stops! I could never describe the issue of low motivation for learning that so often occurs by middle school if not in earlier grades better than with this quote from Newsweek: “They didn’t stop asking questions because they lost interest. It’s the other way around. They lost interest because they stopped asking questions.” It’s not all the fault of parents – some teachers encourage questioning and others don’t – but nevertheless parents need to keep the spirit of curiosity alive regardless of the school’s role in their children’s development from year to year. Third in importance for today’s parents and grandparents to understand is the long-term benefit of promoting the skills that “Grandma” (in my book) says she values from early childhood on. The research points out that children whose curiosity, imagination, and divergent and convergent thinking are encouraged over time tend to excel, i.e. they finish high school and they finish college at much higher rates. This only makes sense. If they stop asking questions and start languishing in the classroom by or before middle school, a downward spiral is inevitable. The bottom line of the Newsweek article is that although we have always valued creativity in American society, we are not purposely fostering it. We need to do that. Creativity doesn’t just happen! This entry was posted in Core elements of learning and being smart, Creative Kids, Definitions related to talent development, Early Learning, Grandma says it's good to be creative, Growing up smart, Teaching smart kids, Young Children and tagged ages 0-7, be smart, caring about ideas, children's picture books, convergent thinking as part of creativity, curiosity, divergent thinking, encouraging creativity, grandparent alert, imagination, learning through exploration, life-long learning, parent alert, pre-k to 2nd grade learners, raising smart children. Bookmark the permalink.